Mealtime is most dogs' favorite time of the day, and they trust that what we're giving them is safe - and we trust that too. 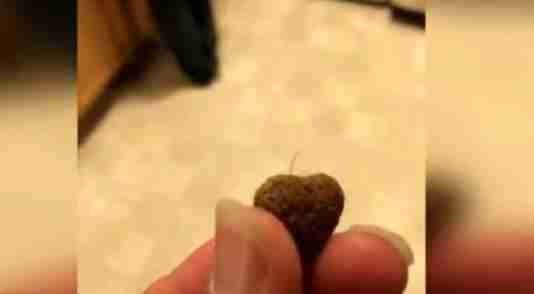 But a bunch of dog owners had that trust broken recently when they found what appeared to be tiny wires in Pedigree brand dry dog food. Pedigree has made statements that, after extensive testing, they've found that the "wires" are not wires at all, but naturally occurring meat fibers. But some people have reported that their dogs have become ill after eating the Pedigree food, or have just refused to eat it altogether, which should say something - some dogs will eat just about anything. On every new Facebook post Pedigree makes, more and more concerned people are commenting, sharing their stories of finding the "wires" and warning others against buying the brand. But in one recent Facebook post depicting a picture of a dog saying "More! More! ", many commenters made very clear that their dogs were not asking for more of the new formula. One concerned dog parent actually held a magnet up to her dog's food - and she claims the magnet stuck. @DANKCATNIP We understand your concern. Natural fibers from meat & bone meal are safe for dogs to consume. Call 1-800-525-5273 (8-4:30CT). If you have concerns about your pet's food, check out Pedigree's Facebook page, or call 800-525-5273. Pedigree did not immediately respond to The Dodo's request for comment.